Does your desktop look like a war zone, with icons and documents scattered all over the place? You’re not alone, and Desktop Groups 1.4.1 (Mac App Store link) is a great way to keep your files organized. 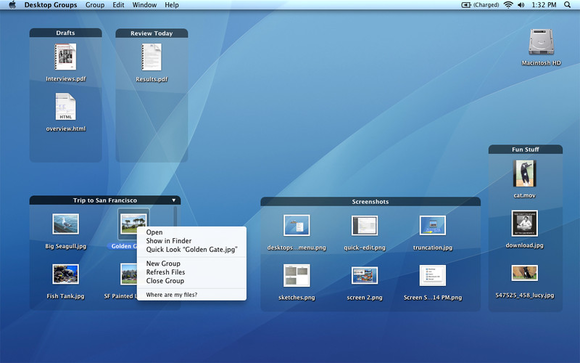 The app allows you to divide off the contents of the desktop in arbitrary containers—appropriately called “groups.” Each group can be home to as many files as you need, and, like a Finder window, can be resized to your liking; if its contents exceed the visible area, you can just scroll up and down with your trackpad or mouse until you find what you’re looking for. A few additional features, such as the ability to list the contents of a directory right alongside its icon, support for customized background colors, and integration with Quick Look, make Desktop Groups an invaluable tool for getting a handle on your desktop clutter problem. If you like to use your desktop as a place to save frequently-accessed files, Desktop Groups can help keep those files organized.